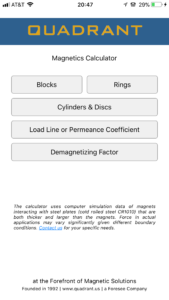 Quadrant Magnetics Calculator is now available to download in Apple APP and Google play. 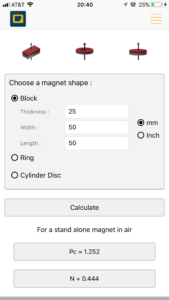 Quadrant Magnetics Calculator provides a mobile APP to conveniently calculate the magnetic force F, the permeance coefficient Pc, and the demagnetizing factor N for various magnet shapes and dimensions. 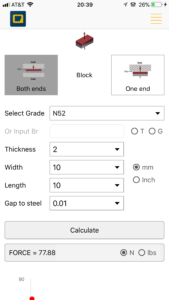 Quadrant Magnetics calculator uses computer simulation data of magnets interacting with steel plates (cold rolled steel CR1010) that are both thicker and larger than the magnets. 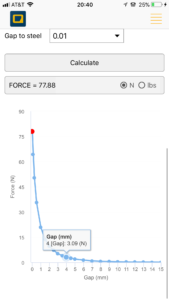 Force in actual applications may vary significantly given different boundary conditions. Contact www.quadrant.us for your specific needs.